On Windows 8 and 8.1, like other version of Windows, you may have to completely exit and restart your browser for the blocks to start working (or for the blocks to go away once the blocking time is up). On Windows 8 and 8.1, exiting the browser can be confusing. On Windows 8 and 8.1, like other version of Windows, you can remove the blocks by restarting Windows. This also can be confusing on Windows 8 and 8.1. 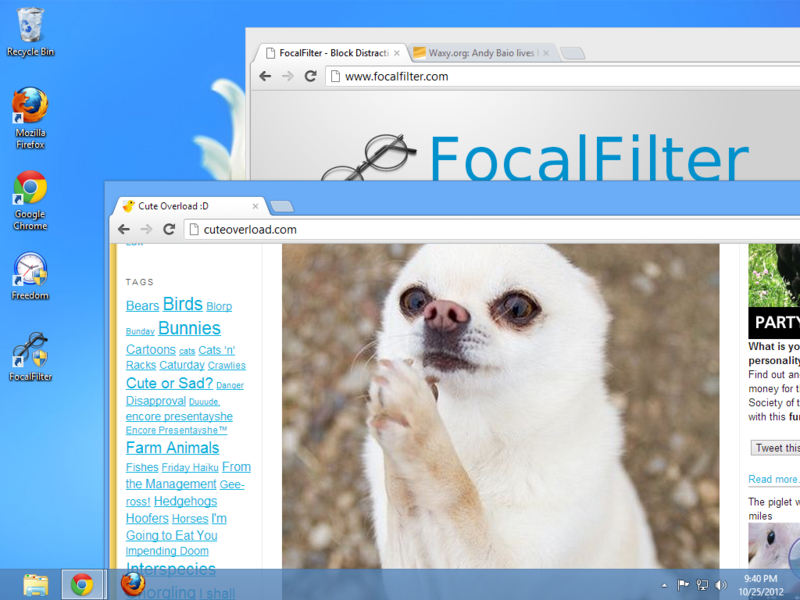 How to deal with FocalFilter depends on which of these modes you are in. I'll explain below. 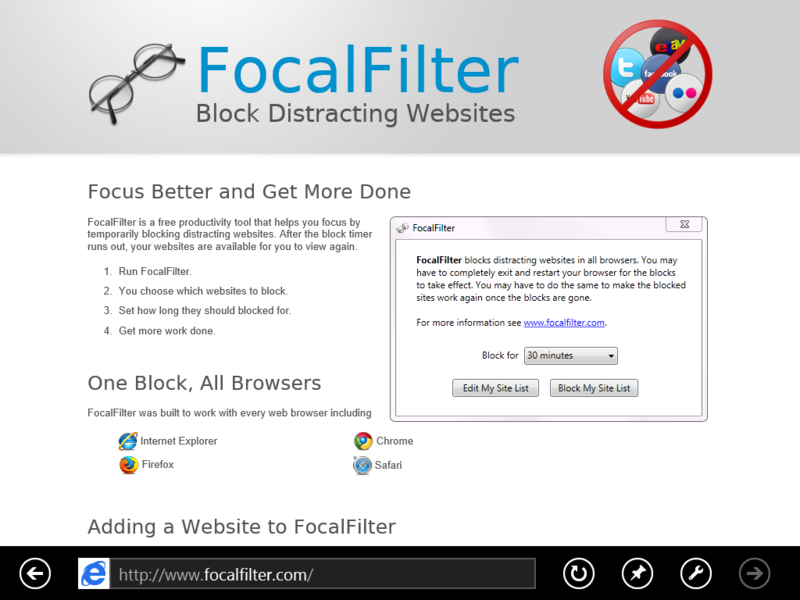 FocalFilter will remove active blocks if you restart Windows (i.e, reboot your computer), but for that to work on Windows 8, after you restart you need to switch to desktop mode and wait for the FocalFilter window which will appear if you have active blocks. This window will ask you if you want to remove the blocks. On Windows 8.1 you will be in desktop mode by default (unless you have a tablet), so as long as you stay there until the FocalFilter window pops up, you will be fine. 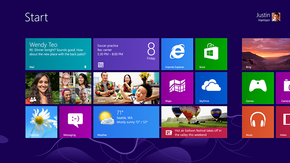 In Windows 8 you are in Metro mode by default but some browsers will run in desktop mode. In Windows 8.1, you'll be in desktop mode by default (unless you have a tablet), but if you start some browsers such as Internet Explorer from the Metro start page, they will run in Metro mode. If you are running your browser in Metro mode, you have to understand switching to another application or switching to the old style "desktop" browser does not exit the Metro mode browser (it stays running in the background)! Instead, you should hit Alt-F4 while using the Metro mode browser to make it exit. Even if you don't see the browser running when you switch to desktop mode, it may still be running in the background in Metro mode, which is why you have to use Alt-F4 while using the Metro mode browser. 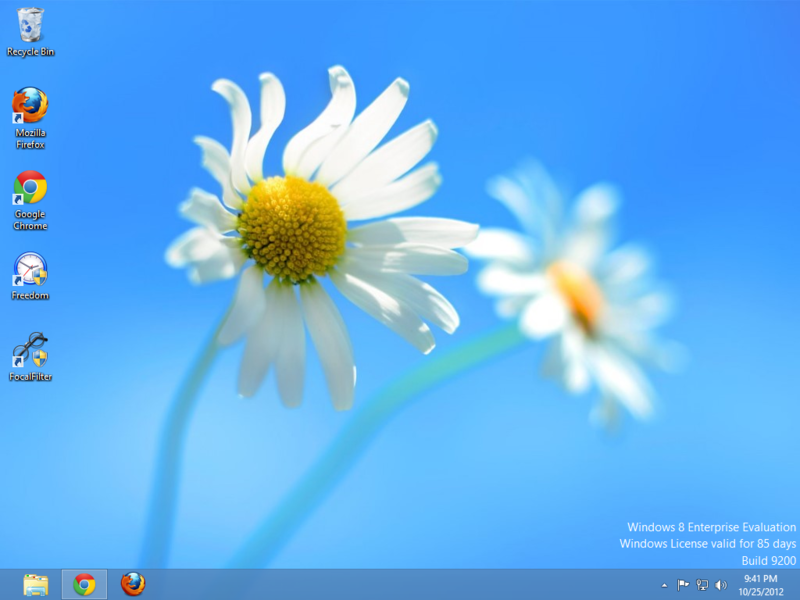 Here's another example of the desktop mode interface. You don't see any browser windows, but the Chrome browser is still running, as you can see from the shaded box that Windows has put around the Chrome icon in the taskbar, in the lower left of the screen. 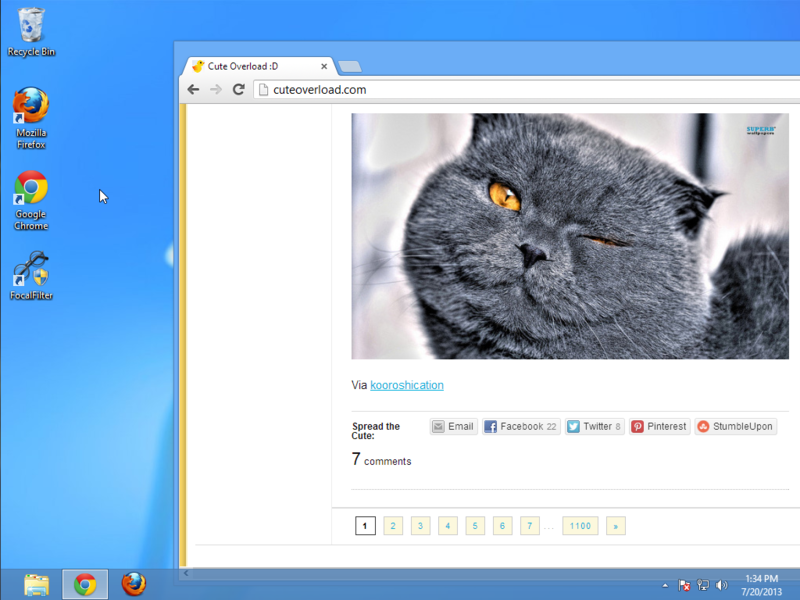 To exit the browser, you need to click on that icon and close all the Chrome windows that come up. Other browsers work the same way.